Getting money from people is fun. Filling out disclosure forms about those people is a pain. It's also a legal necessity, meant to keep things transparent. Political candidates must submit donor disclosure forms, which list donors' names, addresses and occupations, every few months during the early months of the campaign, and as frequently as every 24 hours closer to election day. More than 900 people have donated $100 or more to the seven candidates for Humboldt County supervisor, and the candidates have filled in the blanks on all of them. Or wait -- make that, most of them. 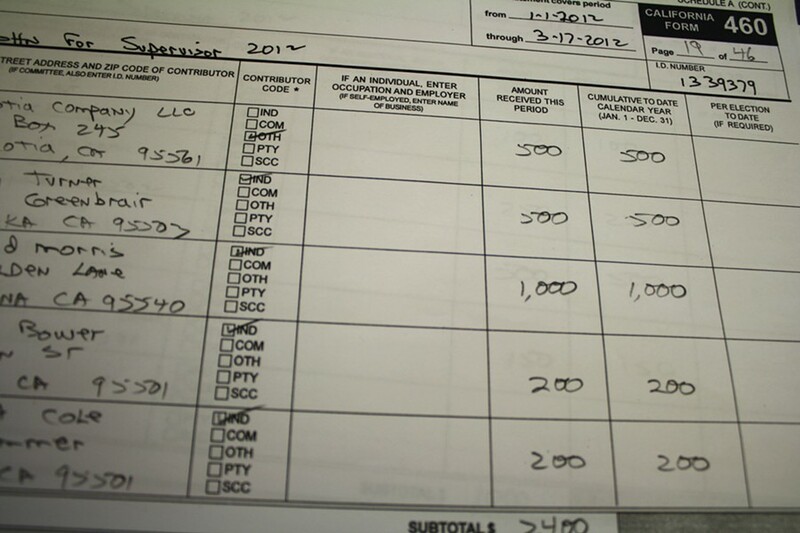 First District County Supervisor candidate Rex Bohn's donor disclosure form for the January to March filing period is missing occupations for more than 60 donors, who collectively donated about $14,000 to his campaign. That violates California Fair Political Practices Commission (FPPC) rules, which state that occupation must be noted. Furthermore, most of the donations without occupations date back two months or more, with some as old as nine months. According to the FPPC, donations that go unoccupied for more than 60 days must be returned. Is that election fraud? Is this RexBohngate? The maximum fine for each violation is $5,000, and the candidate must give the money back, said FPPC spokesperson Tara Stock. Will Bohn soon be out $314,000? Unlikely, says FPPC chief of enforcement Gary Winuk. "It isn't enforced too much." He said that in an investigation, the FPPC tries to determine whether the omission was intentional, whether it was an oversight, or whether it was due to a lack of political sophistication. "In general, if people admit their mistake and fix it, we just send them a warning," said Winuk. Most investigations begin with a complaint from a political opponent, Winuk said. The FPPC has not received any complaints about the Bohn filings. Bohn sounded surprised when asked about the missing occupations. "I saw them. ... I didn't see any blanks for the occupation," he said doubtfully. "Gimme some names." "Paul's an attorney," Bohn replied. "He and I went to St. Bernard's together." "Owns Lima's Pharmacy," he said. This continued for 20 or so names, with Bohn remembering every donor's place of employment. What happened, said Bohn's financial guru John Fullerton, was that the volunteers tasked with filling out the donation forms didn't realize the importance of noting occupations. "I got all the reports on the morning that the report was due. And, it was also during tax season, and I'm a CPA," Fullerton said. He noticed the error, but figured that it would be better to get the forms in on time without the occupations than to turn them in late. Fullerton said he would consult with the FPPC to see what steps the Bohn campaign should take to make things right. Over in the 3rd District, the occupation section of both the Brooks and Lovelace donor disclosure forms contained some oddities. Both Schmidbauer and Pell are retired. Why, then, list their occupation as "none"? Semantics, said Brooks. "When they're not working, if they don't have an occupation, that would be, "none," she said. "You either have a job or you don't." She turned the subject to her opponent, Mark Lovelace. "Mark's report is riddled with errors," she said. Lovelace just wrote, "requested," for some donors' occupations, and at least one dated back to March 30 -- exactly 60 days ago. "Technically, he should return those contributions," Brooks said. Lovelace, reached by phone at a conference in Sacramento, said that many of his donations came through his website, and didn't have personal information attached. "We've been trying to chase down the rest," Lovelace said. "It's not like there's any donations that are anonymous or anything like that," he continued. "In this community, I think the names are pretty clear."